You could probably come up with an online casino catering for fantasy and fairytale slots alone, so many of them are there on the market. Super Lucky Frog mines similar territory. A 5-reel, 25-payline slot, it has everything you’d expect from a fantasy-inspired game, and carries a maximum jackpot of $15,000 to boot. The reels are stuffed with images like griffins, fairies, imps and our titular frog, plus snails, butterflies, ladybirds, unicorns and toadstools. So far, so Snow White. Look out for the Fairy in particular, as she activates free spins when you hit three or more anywhere on the reels. Anything from 10 to 30 spins can be yours when you hit those Scatters, and a 3x multiplier is applied to all winnings. The Wild pixie – looking a lot like Link from Legend of Zelda – substitutes for all symbols other than the Scatter and Bonus, and will bag you a jackpot of 7,500x your line bet if you hit five across the reels. 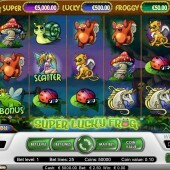 There’s one more bonus to be had in the game – a Wheel of Fortune type feature – which is triggered by three or more Bonus Lucky Frogs across the reels. Here’s your chance to bag one of three progressive jackpots – Lucky, Super or Froggy. While not quite reaching the heights of jackpots hit in Net Ent's new 2014 slot, Cosmic Fortune, they're certainly decent enough. 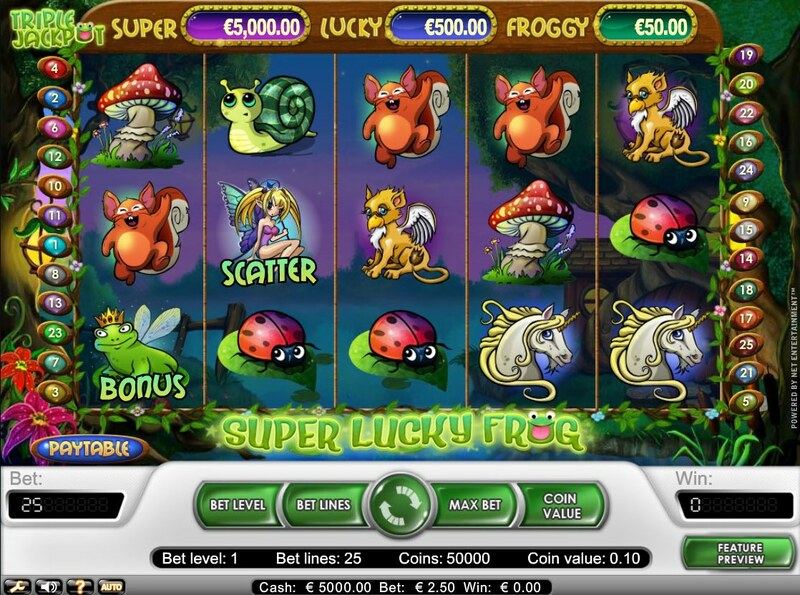 Fairytale-themed slots come and go, but as long as cutesy free spins ‘n’ Progressive Jackpot-offering slots like this one exist, there will always be a market. To be fair, the progressive probably saves this from the bargain bin of fantasy-themed games, but for now, it’s one of the best around.